Take delicious Prosciutto Wrapped Asparagus up a notch with the addition of toasted almonds and Gorgonzola cheese! Asparagus season is in full swing. One of my favorite ways to enjoy this vegetable is sauteed in olive oil with just a little salt and pepper. So simple, so delicious. But, these tasty little Prosciutto Wrapped Asparagus spears are super easy to make and equally as delicious! They are great as an appetizer, side dish, or party finger food! The addition of toasted slivered almonds and Gorgonzola cheese take the whole recipe up a flavor notch! Prosciutto is an Italian dried ham often compared to bacon, but thinner and less greasy. It’s easy to wrap around individual asparagus spears and crisps up quickly when placed under the broiler. 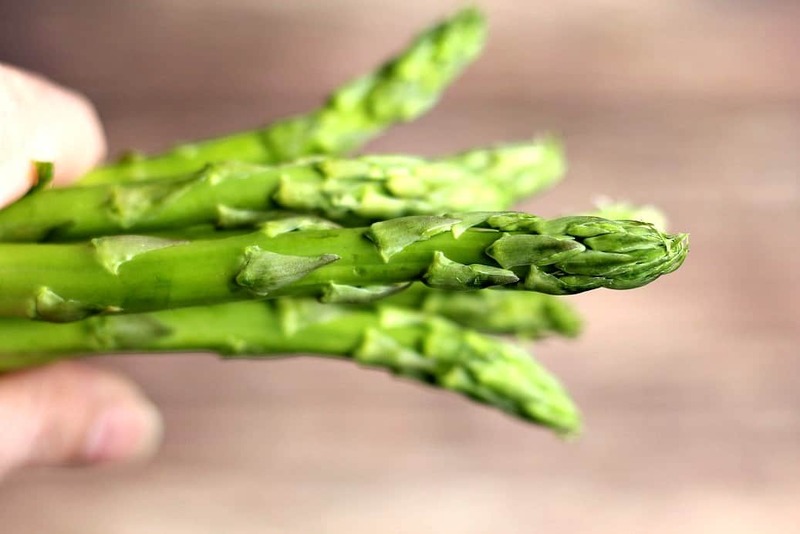 Cut off the ends of the asparagus, wash, and dry it. Slice the prosciutto in half length-wise. Add a very light coating of olive oil to a baking sheet. Turn on your broiler. Wrap one piece of prosciutto around each spear, starting just under the head and wrapping in a downward spiral. Lay each spear on the baking sheet so that they are not touching each other. Place under the broiler for about 3-4 minutes, then rotate the spears and broil another 3-4 minutes until the prosciutto is crisp and the asparagus is just starting to brown. Remove from the oven and set aside. In a small skillet over medium heat, add the almonds and toast for about 3 minutes until they just start to brown. Arrange the asparagus spears on a serving tray. Toss the toasted almonds all over the asparagus, then the Gorgonzola cheese. Serve! If you don’t like Gorgonzola cheese, you can try making these Prosciutto Wrapped Asparagus spears with another type of blue cheese or even feta and still have a somewhat similar taste profile. Prep: turn on your broiler. Cut off the ends of the asparagus, wash, and dry it. Slice the prosciutto in half length-wise. Add a very light coating of olive oil to a baking sheet. Wrap one piece of prosciutto around each spear, starting just under the head and wrapping in a downward spiral. Lay each spear on the baking sheet so that they are not touching each other. Place under the broiler for about 3-4 minutes, then rotate the spears and broil another 3-4 minutes until the prosciutto is crisp and the asparagus is just starting to brown. Remove from the oven and set aside to cool. While the asparagus is cooling, add the almonds to a small dry skillet over medium heat. Toast for about 3 minutes until they just start to brown. Remove from heat. Present: arrange the asparagus spears on a serving tray. Toss the toasted almonds all over the asparagus, then the Gorgonzola cheese. Serve! Yum! What an easy, yet elegant appetizer. Love the presentation. All those flavors sound incredible. I love the idea of wrapping prosciutto around the asparagus, usually I try it with bacon. Going to have to go to the store and get some prosciutto now! YUM!! This looks delicious! I could eat this as a meal. Can’t wait to make it. Prosciutto is my favorite! I’ve never added almond and gorgonzola, but this recipe is fantastic! I am always looking for good vegetable recipe ideas. This looks delicious.